We spent the day yesterday with longtime friend Kevin Waiters and his wife Martha. Kevin attended both college and seminary with me, and since he lives in Tacoma, we keep in touch as the years go by. 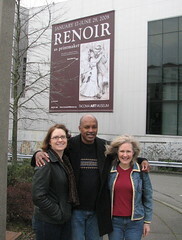 Kevin and Martha are Renoir fans and invited us to join them at the Renoir exhibit in the Tacoma Art Museum. It was good for this old country couple from kitsap to get some culture. The exhibit focused on the artist's printmaking work which was very interesting. After the museum, we enjoyed dinner and conversation at the Point Defiance Anthony's.